The brown recluse spider bite is more dangerous than the Black Widow, as their venom causes necrosis. A single bite from a brown recluse may be deadly to humans. Necrosis is the premature death of cells in living tissue usually caused by external infection or toxins. The Brown recluse spider is one of the most deadly spiders in North America. The wild variety lives mostly in the southern United States from Texas to Georgia. Benjamin Fulford may be the New World Order’s brown recluse spider bite. Spider bites from the brown recluse spider [Loxosceles reclusa] have been proven to cause necrosis. Bluefin Tuna sold for $736,500 at Tokyo’s Tsukiji fish market. 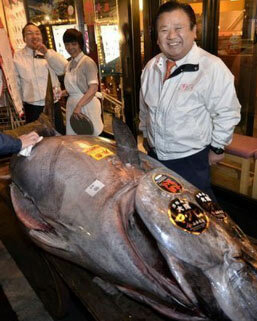 A single bluefin tuna sold for a record $736,500 USD at Tokyo’s Tsukiji fish market on January 5, 2012. Wow, a $736,000 tuna. A single 593 poundlb bluefin tuna sold for a record $736500 USD at the Tsukiji fish market auction in Tokyo Japan The best slices can sell for 2000 yen or $24 per piece in Tokyo sushi bars Fish is the new gold. Kiyoshi Kimura, the winning bidder and President of Kiyomura Co’s Sushi-Zanmai restaurant chain, said he wanted to give Japan a boost after the devastating tsunami of March 2011. The Japanese eat 80 percent of the Atlantic and Pacific Ocean bluefins caught, the most sought-after by sushi lovers. Bluefin tuna is prized for its tender red meat. The best slices can sell for 2,000 yen [$24] per piece in Tokyo sushi bars. Caught off northeastern Japan, the 593 lb [269 kg] bluefin tuna sold for a price of $1,238 per pound. Japanese officials still don’t have control of the Fukushima Daiichi nuclear disaster with radiation comparable to Chernobyl. The crisis is not over. It’s not contained. Truth is, the cleanup will take 50 to 100 years. 100% core melt in all 3 reactors. Fukushima is still a ticking time bomb. This could be the worst industrial accident and disaster in history. Physicists knew all along it was much more severe than what they were saying because radiation was pouring out. TEPCO has finally confessed as to how bad it really is. Aerial view of Japanese Villages Wiped Off Map. The tsunami destroyed everything in its path. Satellite view of the destruction on the ground in Japan.